She has Garden Design qualifications from Abingdon and Witney College and Higher National Certificat from Pershore College. She also holds a Graduate Diploma in Landscape Architecture with Distinction from Birminghham University. In 2012 she won the national design competition from Jackson Fencing. As well as new designs, spring/autumn make-overs and restoration work are undertaken. This can be done in conjunction with you to learn these skills. 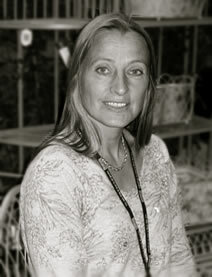 Since 2002 she has been able to fully devote her time for her passion of the garden. Smaller gardens intrigue her and she loves the challenge of the larger space. She strives to maximize the potential of the land and together with the client produce something personal, inspirational, practical and sustainable. She creates unique designs and believes the garden should have a welcome and relaxed atmosphere, which harmonizes with its surroundings and contains the values to which the client aspires.